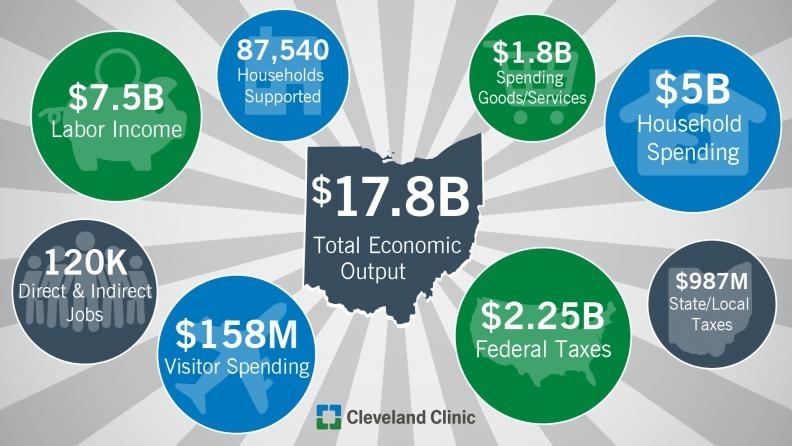 Cleveland Clinic, the second largest employer in Ohio, reports that it boosted Ohio's economy by $17.8 billion in 2016, according to the system's latest economic impact report, which it produces every three years. This is up 41% compared to the previous 2013 report, which showed $12.6 billion in economic impact. The report, "A Vital Force in Ohio's Economy," shows that the Clinic's activities supported 119,720 Ohio jobs in 2016, representing more than $7.5 billion in total earnings, which supported 87,540 households statewide, for a total of $5 billion in household spending. The report was prepared by Cleveland-based Silverlode Consulting, which specializes in site selection and other economic development-related activities. "Cleveland Clinic is the economic engine of Northeast Ohio," Cleveland Clinic CEO and president Dr. Tom Mihaljevic said in a prepared statement. "We are the largest employer, a major purchaser of goods and services, and a generator of tax revenues for government at every level. Our economic activity supports families, neighborhoods and community life. It brings opportunity and prosperity to the areas we serve." The total jobs cited in the report reflect both direct (58,610) and indirect (61,110) jobs. According to the release, direct jobs include Clinic physicians and employees, joint venture employees, on-campus hotel jobs, on-campus parking jobs and jobs existing at spin-off companies, while indirect jobs include those supported by industries purchasing from the Clinic. Though most Clinic operations are tax-exempt, billions of dollars in taxes (local, state and federal) can be attributed to the Clinic, according to a Clinic news release: $2.25 billion in federal income taxes paid by employees and vendors and $987 million in state and local income, property and business taxes. • The Clinic purchased almost $1.8 billion of goods and services from Ohio businesses. • Cleveland Clinic visitors contributed more than $158 million to the state's economy. • Compared to the prior report in 2013, the number of supported jobs increased by 28%, from 93,560 to 119,720, while labor income increased 27%, from $5.9 billion to $7.5 billion. • Between 2014 and 2016,the Clinic invested nearly $808 million in real property improvements, supporting nearly 3,200 construction jobs per year and exceeded $164 million in direct and indirect labor income, on average, over the three years. • The average fiscal impact of the Clinic's construction activity between 2014 and 2016 was nearly $24 million in state and local taxes and almost $35 million in federal taxes per year. • Cleveland Clinic issued similar reports for its economic impacts in both Florida and Nevada. Cleveland Clinic Florida contributed $1.2 billion in total economic output statewide. Cleveland Clinic's Lou Ruvo Center for Brain Health contributed $47 million in total economic output statewide. "Cleveland Clinic reports it boosted Ohio's economy by $17.8 billion in 2016" originally appeared in Crain's Cleveland Business.